i hope u are fine and in good health. I live in the Arab world and i want to come to california where i belive the lucky mojo shop is located to buy my supplies and meet the folks there, i have already checked out my tickets etc..but i dont kno what airport to go to and where to stay because i want to be close to the shop and its owners. I asked a agent and he said caifornia is very big, so i dont wana end up lost or doing spells trying to find my way home lol.. So please can somome give me the nearest airport, town of stay etc..
Re: How Do i Get to Lucky Mojo Shop? The nearest major airport for international flights is probably San Francisco (SFO). San Francisco is about an hour away from Lucky Mojo. 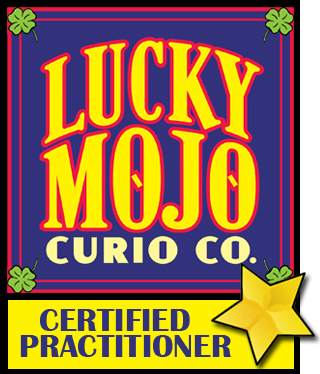 If I were to drive up to the Lucky Mojo store would I find everything on the shelves the same as it's listed in the catalog online? Could I just pick up spell kits and get fixed bottle spells? If I wanted a fixed mojo hand would that be done while I was at the store? Visiting the Lucky Mojo store is a wonderful experience! You will find spell kits, oils, sachet powders and incenses on the shelves, along with herbs, minerals, and curios and much, much more! When you say you want a "fixed" mojo hand, do you mean you want a normal mojo hand to be fixed for you or do you want a custom made mojo hand? I am not sure what the answer to that question is, but if its a custom hand you are after you would want to call ahead because the making of a custom hand might have some timing restrictions and not be something you could get right there and then that day. Everything we sell online is available in the shop -- plus items not listed online. If you have an extensive shopping list, you can use the shopping cart and order some things ahead, so will be sure to have made them by the time you arrive, and note in the comments field that you want the goods marked "HOLD FOR PICK-UP" -- that way we'll have everything on the list on hand, and you can shop for other items when you get here. If you want a mojo bag made with your own hair, handwriting sample, etc. in it, or a bottle spell fixed for you, you can ask us to make it while you wait. Just be aware that we can't quickly make 40 things while you wait. Thank you!! I hope to make a trip up next week or possible the week after. I made my first trip to the Lucky Mojo store today and I came home full of happy. I was greeted by a beautiful dog and a very nice gentleman, who's name I didn't get. I loved being able to go through and touch and smell everything and see where the magic happens. The little church where the candles are lit was gorgeous and I would not hesitate to have candles lit there for myself. A very sweet and knowledgeable man, who's name I can't remember, helped me out, dressed my candle and fixed my attraction bottle. They dress candles better than any other shop I've seen. He had the most helpful advice and the candle dressing was obviously very powerful. I think I need to get in the habit of going to the store to shop instead of ordering online. The store has wonderful energy and I love the puppy!! Sounds like a wonderful visit! Makes me wish I lived in CA so that I could visit and see for myself! If you give us advance notice, we'll ring the railroad crossing signal bell to greet you. Wow!!! Its amazing!!! What a beautiful location! Thank you so much to Laughingdog for posting the videos, Its great to see the place and see where all my items have come from. I hoping next year to fly out to make it to the workshops Miss Cat holds at the shop in May, as its my birthday at the end of April and I've never been to the states before, I want to make a special pilgrimage and combine a holiday and visit Lucky Mojo!!! Laughingd0g did an amazing job! It is really helpful to people that can't get to the store to see it. Especially the Mission Church. It was wonderful to actually see candles burning inside and outside. I couldn't believe how many candles were burning it was a lot! What do you do with peoples petitions and pictures that they send do you fold them up and put them under the candle or tape it to the back? You know I have a friend that thought that they were not really burning candles for people that they just wait and write something down. I didn't think that, but she did. This should really help people that are nay sayers or that need proof. The tour was very cool. Was the skeleton real? If it was it's probably the first and last person who ever tried to shop lift from the store, lol! Very helpful indeed, Thank You Laughingd0g! You just answered a lot of questions and I appreciate that you were respectful of people while filming. I saw it today and I think that it was SO helpful! Now we know that it's not some warehouse. there are prepackaged ready to go stuff, but you also see somebody preparing some incense, so for people that are nay sayers here is your proof it's a real store. Every time I've visited the store I've always had employees put down what they were doing to help me out, suggest spells, fix things, dress candles, walk me around and point out items on the shelf, etc. Is it appropriate to tip the employees in the shop? That is a GREAT question. I often wonder that myself. I know there is envelopes at the counter that you can leave donations. I have been thinking that I may just buy everyone a coke and smile the next time I go in. I am due to go in on Feb. 6th. You know what would be cool? To dress the coke bottle with blessing oil, because I want them to be blessed! Oh! I am so creative, and I can be funny, too! LOL! Tips are always apprecited - some folks tip the readers or the candle setters. Sometimes clients send or bring in candies or floral arrangments. We love being given treats! Hmm, I cant seem to view the 5th video, I keep getting an error message. I viewed the links and it was like being there. lucky mojo is a beautiful place, and i hope to come visit before the year is over with. blessings! don't worry, just be happy! I had been wondering for a while about the design of the building and the creative idea behind the size, colors, build, etc. I enjoyed reading and seeing "the renovation" of the Church. Yep, that takes me back in time -- fall of 2006! The church has seen a lot of use since then. I read tarot cards in there 5 days a week, and Elvyra Love reads in there on the two days a week that i am off. Many thousands of candles have been lit for clients in the church since Consecration Day, and many a spell cast on the altar, for this is where i dress and pray over the sterling silver protection amulets i make for my clients. Thanks for bringing up the memories! You are welcome! I would really like to come to Forestville California one day just to see everything in person! You found my special happy-place pages here on the site. I LOVE to look at the pictures on that page and was quite thrilled when I found them. My wife and I are looking to move very soon and yearn for some land, chickens, out buildings, etc...so the pictures of the church, etc bolster my spirits! I will attest to the sight of the Church and Shop in person, it's mighty incredible and has been my wife and I's vacation spot now for two years. Birthdays, holidays, get away from the city days...you name it! We have fallen in love with the surrounding area and have a blast every time we are there. We even spent our honeymoon deep in the woods about 15 minutes away from the shop. Magical. Tranquil. Thank you for posting your thoughts on that page. One of my favorites! Thank you Ritual Sound! I am going to do whatever it takes to try to save money and take a trip there next year! I found some other pictures even an online video from a nice lady who had visited in May for Mrs Cat's Birthday and "the weekend of learning". The entire property is beautiful!!! It is so lush and green and seems so peaceful! Good luck with your saving and trip! Make it happen! I'm terribly excited and on my way up the coast (right now I'm in Monterey). Come Wednesday or Thursday I'll be in Forestville for reasons I'm sure you can guess. I'm on this "vacation up the coast" along with my parents, who are coming along with me to Lucky Mojo as well, I'm hoping they'll enjoy hiking in the surrounding area or something. Anyway, I'm sure I didn't have to start a thread to ask this question... but I seem to be doing that any way (maybe I'm just hear to share my sheer excitement for being on my way to LM!). Getting to the question - At some point I hope to take Cat's Correspondence Course but as of right now I'm just heading to the shop to... shop. This will be my first purchase at Lucky Mojo (surprising considering how much time I spend on the web site) and I am just wondering, because you have to make a certain amount of purchases at LM before Cat considers you for the course, do I let whoever is checking me out know that I want to at some point take the course? Or should I notify cat? Sorry if this is a dumb question, like I said, just excited. Hey, ghostsong -- i hope to see you when you show up at the shop. If you want to be signed up for the newsletter (and get the monthly discount coupons) and build up a supply of things you will need to take the course, just let whoever writes up your order know that you want to fill out the name, address, and email portion of the order form. (Otherwise you will be listed as a "walk-in" and get no pre-course credit for your order. Also, talk to anyone (or me) about what you need to order -- you need to make at least four orders over a period of time, but the purchases have to cover a set series of types of products, because i cannot teach you about bath crystals if you've never seen bath crystals, or about incense if you've never seen incense. Be sure to stop by the church when you come to shop, and pick up your free souvenir Churcfh Fan. Guerneville, CA 95446 and is really a treat to see. Thanks Cat for responding, and clearing that up for me. I hope to see you there when I come by, I sure can't wait until I do. I'm just scared I won't be able to leave, haha. That sounds great Joseph, I will be sure to tell my parents about that beautiful sounding hike. Thanks for letting me know, and I just know I'll adore the shop... I've already been in awe just gazing at the pictures (though I didn't look at them all, I wanted to leave some of it to surprise). Just want to second Ritual Sound on Armstrong Woods as a nice hiking spot for your parents. Was just there (and at the shop) this past month and hiked up the east trail. That one is 2-3 hours to walk and you'll have lots of time to shop and visit at the store! There are longer and shorter hikes too, of course. You will love the experience of LM - the flowers along the path, the church, the sounds and smells of mortars and pestles as the staff makes the products we all so enjoy - have a blast! I made a thread in the "Help with your Situation" subforum here, asking for advice on what to buy at the Lucky Mojo Curio Co. I got a lot of great advice from forum members here, and wanted to share my feelings about visiting the shop with you all. First, Catherine is a most gracious host, I literally felt like some kind of VIP as soon as I entered the store. I was lucky enough to get to meet and have some very cool chats with Catherine while I was there, I am very grateful to have had the chance. A very warm and wise lady, that Catherine. I was also quite taken by how friendly and truly helpful everyone working in the store seemed to be...none of that sighing while "helping" you out stuff that can be all too common in most customer assistance type situations...and this is something I had noted already any time I have ever called LM, the people were not just willing to help, but they actually seemed happy to help. I had my lists of items to buy and tried hard to stay focused on finding them and putting them in my wooden tray, and I did try to keep within the set limit I wanted to spend, but that was a joke....I knew I'd need some leeway and just went ahead and grabbed all of the things I knew I wanted and needed. I had people waiting for me in the car, so there was that hanging over my head the whole time, so my advice to anyone who goes to the store is to not have any kind of time limit, there is just so much to see. I could have spent at least another solid hour in the store, and as it was I did spend over an hour!! So, realistically, give yourself maybe a couple of hours to be there to get a good gander at everything. While I did get all of the roots, oils, powders and other odd bits that I wanted/needed, I saw so many other things that I know I am going to have to buy, especially the skull bead Mala, that is the coolest set of skull beads I have ever seen, and I am an afficianado of skull beads. There were also these beautiful carved fish beads, very Pisces looking, two fish sort of in a circle together, that I am going to buy myself. And so many other items and curiosities that I caught glimpses of while I tried to stay focused on my lists. So, anyway, Thank you so much, Catherine for such a warm welcome, and thank you to all of your staff for their help and their patience and their knowledge. I had such a wonderful time. Please, any members here who might be close enough to visit LM, do yourselves a favor and go for it. You will be so happy that you did. Preppieroots, it was wonderful to have a chance to chat about everything from conjure oils to dog breeds and back again. Your daughter is a real charmer, by the way -- such a sweet look and pretty ways. Sorry you went over budget -- but i hope you enjoy all the goodies you scored. Catherine, thanks (about my girl) I agree totally! She's a charmer. And as for my budget, well, that sort of worked it's way into my Homework...I put my partner's name first, turned the paper and then put mine on top, because I realized that while I may not have been doing a full on trick with oils and candle etc, maybe a name paper could do just enough something-something that I could get away with that total without even a sigh... which I did...as soon as I got in the car, he asked how much I had spent...I said how much and he just said "oh" and left it at that. No pouting or lectures, and he was in a very good mood for having sat so long waiting for me too, which is very much out of his nature. A very good thing all around, doing that homework assignment. Anyhoo, no problem at all about my budget, I am literally giddy about my loot, it's all waiting to be unwrapped and placed on my shelves in a quiet corner of the house. route95, maybe you'll get to visit the shop sooner than you imagine!! I hope you can someday!! Glad to hear you had such a good experience! I'm blessed to live an hour away from Lucky Mojo shop and do love my visits. I agree with your assessment of timing...if you do go give yourself plenty of time. I have never once felt like I was being rushed, hurried, or ushered out the door at any time. I have worked retail my whole life and realize that it can get tough, but everyone has been a peach to me and my wife --- each and every visit. Tomorrow my wife and I get to further enhance and advance the work we have been doing by signing up for the Correspondence Course (finally after wanting to for 2 years! ), and I would advise everyone reading this to head over to that page and consider if it is right for you! I'm still very happy to read every testimonial from people who get to visit the shop. It is amazing, and "real," and a darn good time! Seriously... It was, wan't it?! The video was great and narration was excellent, I can not wait to visit , meet everyone and shop! :) All I can say is WoW! After a smooth,long drive up to Forestville, Odu777 and I arrived at the Lucky Mojo Shop. The setting and the shop were welcoming.There is an incredible and broad array of everything a practitioner could want or need. The staff, notably Greg and Alicia, were amazingly knowledgeable and personable. We have been hard at work using Cat's products. Cat's Spiritual Cleansing products are potent and incredibly effective. Her directions are extremely thorough. The results have appeared already. Good news arrived and a welcome,formerly m.i.a., family member has come over. Fiery Wall of Protection is next. Great testimony; welcomed and appreciated. Lucky Mojo is a wondrous place to be. I am grateful this place exists. I did not expect to actually meet Cat, however, I did. She has a presence that is unmistakeable. Cat you are a Wise Woman. Thank you for spending time with me and my other half. I would very much like to thank to both Robin and Alicia for the sharing their knowledge and smiles. Blessings to you all at Lucky Mojo. I am glad that you are here for those of us who need you. That's awesome....I have a tentative date in my mind to make a trip out to Northern CA, which will involve a trip to Lucky Mojo. It is sooooo good to hear positive experiences like this! I couldn't agree more. When I went out there with some of my Vodou children in September, I was very pleased to have made the 14 hour flight and 3 hour drive out there .... Miss Cat took time out from her day to show us around, share with us about the history of hoodoo and show us a lot of her collection. The product choices were astounding! The LM staff created oils for us that weren't on the shelves, and nothing was too much trouble. Thanks, all, for the kind words. Everyone at the shop is intent on great customer service, and kudos should also go to Tracy, Heidi, Greg, Angela, Della, and Ernie for making everyone's shopping experience fun and easy. I work in the shop Wednesdays through Sundays. Please do phone a day or two ahead to see if i will be there when you arrive, and what my schedule for tarot readings looks like for the day. If you plan to arrive in the shop on a Monday or Tuesday -- my personal "weekend" off each week -- you can also call ahead to arrange for me to come in and see you. I live right next door to the shop, and i am always glad to drop in and say hello, but you have to speak up and request my presence if you are going to visit on my days off. How to get to the shop in Forestville? Hi, I live abroad in Ireland and planning to go to USA end this month. I want to visit your shop to buy some things I need. If I order online customs charge me to much and as well the order takes long to arrive. My question is how do I get to Forestville? Do I need to fligh into San Francisco airport or is it Santa Rosa the nearest? From there are there buses, trains or any other public transport way to get to your shop? Are there hotels close by to your shop where I can stay overnight? cat has a map here http://www.luckymojo.com/mojocatmap.html. Also, call cat or someone in the shop to answer any inquiries, the forum is not a direct link to the shop. Well, we would love to see you, but be prepared for a drive out into the country! We are about 1 1/2 hours by car north of San Francisco. Your only public transport would be by bus -- from San Franciso to Santa Rosa and then transferring to a bus to Forestville. It is a LONG bus ride -- four hours, perhaps -- because the bus stops in every little town along the way to pick up and let off passengeres. The nearest hotels and motels are in the towns of Sebastopol and Santa Rosa. There are no hotels in Forestville. As always, i apologize for living so far away from an urban environment, but tha's just the way it is. Thanks for all the replies. I probably will take a bus from SF airport to Santa Rosa and stay there in a hotel. The next day bus or taxi to Forestville where I can spent the day looking around and getting all what I need. I will call the shop in advance when I'm due to arrive. Should I put my order in advance or can I find everything on the spot there? Can mojo hands made for me on the spot or do I need to order in advance? Ok thanks and look forward to see the shop and meet with Cat. I live in Sacramento, and drive to the shop which is about 2 hours away all the time. If you private message me when you are going to be in town, and if it falls during one of my trips to the shop, I would be more than happy to give you a lift from the surrounding area hotels. You will LOVE the shop! Brida, that is very kind of you! Also, there are several shop employees who live in Santa Rosa. If you contact us and arrange ahead, i am sure that they will give you a ride out when they come in in the morning. Among those living in Santa Rosa are Eileen, Nicole, Heidi, Della, Tracy, and Angela. They work various days, but all of them come in for work early enough to be here at 9:00 am. Oh, and yes, do call your order in ahead as a "hold for pick-up" -- that way we are sure to have everything made for you when you arrive. Thanks so much Brida and Cat. I look forward to visit the shop. I have to postpone my trip until end of february but I will go for sure. I will contact when I'm due to arrive. I need a few special made Mojo hands for a certain personal thing. What should I do? Do I need to request what I want by calling the shop? Can I also sent an email with my request and what is the email adress? How do I need to pay for this as what I request won't be on the online shop page. Call the shop wendy that way you will talk with a person to help you with your request and you can place the order. You can pay with any of the accepted credit cards.